LaGeSo is the registration office where hundreds of refugees have to wait for days to get their official registration. These 5 children are already waiting for 11 days after a 26 day trip here to Berlin. They are exhausted. Private initiative from Poland to distribute sleeping bags for refugees. Syrian father of 4 kids waiting already 5 days at LaGeSo to get registered. The shoes of a 9 year old Syrian boy who 27 days on the road to reach Berlin. 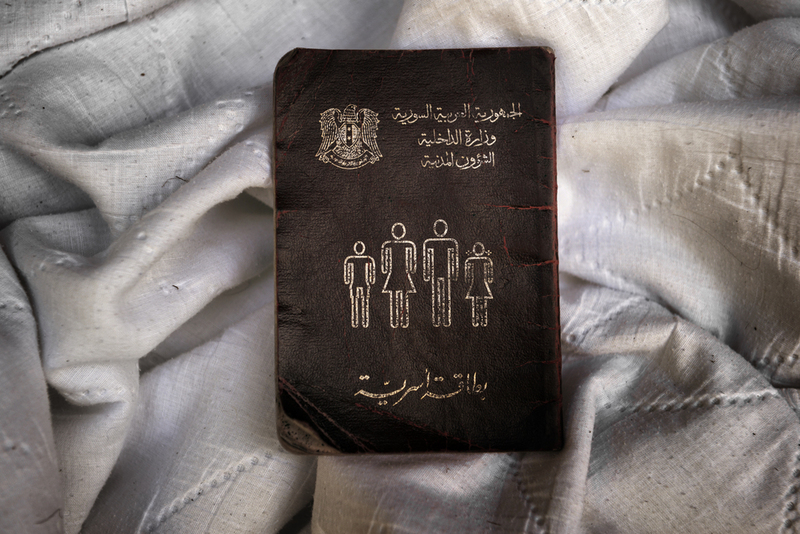 This is the official Syrian Family Card. This document showes the constitution of a family. This building is turned into a emergency shelter for new arrivals. It has opened last Tuesday. With the help of volunteers 226 people are hosted in this 7 story building on a industrial zone in the outskirts of Berlin. Matresses are brought to the building. Till now many people slept on the floor. Syrian girl looking out of the window. She lives with her 2 sisters and mum and dad. They arrived 4 days ago after being on the road for a month. Most traumatizing for them was the crossing in Hungary. Syrian girl with a doll. She was one of the few survivors of a school building bombing in Homs. That was the trigger to escape to Europe. Syrian mother holding a mirror for her daughter. Syrian girl lying in bed. Many children are exhausted after the long trip to Europe. Children playing in the parking lot of the building. For many its the first time they can play since a long time. 16 yr old boy showing picture of himself while in Syria. LaGeSo is the registration office where hundreds of refugees have to wait for days to get their official registration. The Vattenfall office building is turned into a emergency shelter for new arrivals. With the help of volunteers 226 people are hosted in this 7 story building on a industrial zone in the outskirts of Berlin.